Before I talk turkey, I want to congratulate our Keyes Ingredients patients who are making consistently better food choices during our program and beyond. With the holiday season quickly approaching, we want you to confidently coast through – maintaining your healthy weight and making awesome food choices while still enjoying yourself. We have your solution to “eat, shrink, and be merry.” Our first holiday cookbook is full of scrumptious recipes and your exclusive E.A.T. guide that will make you look like a superstar entertainer. It tells you how make recipes early enough to freeze, which recipes to make several days in advance and refrigerate, and what to knock out the night before and the day of entertaining. It is on page 9. I cannot wait for you to see what is inside. 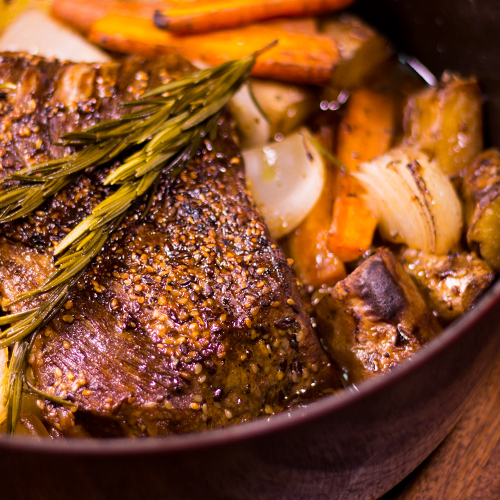 Each recipe is simple and paired with a beautiful photo for all those who eat with their eyes first. Better nutrition is a journey. Journeys take time and always have bumps in the road. We learn as we go and as long as we can learn from a dietary setback, we are still moving forward. We want to encourage you to have a healthy holiday season. Be assured that healthier choices are not only possible but completely do-able. Holidays are based on tradition and traditions are tied to our emotions. If it will not be Thanksgiving without “Aunt Judy’s green bean casserole” or “Nana’s pumpkin pie” then have some! Christmas and Easter in my house are not the same without my Grandmother’s chocolate eclairs. Enjoy it and don’t spend the rest of the day stewing about it. Make healthy choices around the parts of your dinner you are not emotionally attached to. The average person gains 5 pounds over the holidays. Here are a few tips to help you not take part in that statistic. 1. Keep the focus on family and fun. Enjoy the food; just be careful not to make the food your focus. 2. Consider feeding your body the appropriate balance of macronutrients (carbohydrates, fats and proteins). Be mindful of not overloading your plate with empty starches. Portion size does play a factor. We can only metabolize 4 grams of sugar at a time. Foods with added sugar, empty calories (ex. breads/soda) and excess grain are broken down by the body into sugar and eventually stored as fat. 3. Holiday meals are usually harder on the glycemic index due to the nature of the traditional meal. Eating a handful (70-80 calories) of nuts prior to eating dinner helps with this (and makes you feel more full). In order to avoid “mindless eating,” take a small plate and fill it with appetizers and/or snacks instead of continuing to pick at foods blindly. Remember food items that come out of a package are going to have added sugars (80% of the time) and are addictive so…”once you pop you can’t stop” is a fact. Not only for the brand name Pringles but for most packaged foods. 4. Be realistic. You may in fact eat a little more over the holidays. Don’t sabotage a whole day, week or month because you got away from your normal choices. We all fall off a bit. Forgive yourself and get back on track for your next meal. Stressing about it will just release more cortisol into the blood and add to belly fat and we don’t want that! 5. After you enjoy your holiday feast and you are completely stuffed, take a walk. Get some fresh air and bond with family. Take the initiative and invite others to make an active choice. 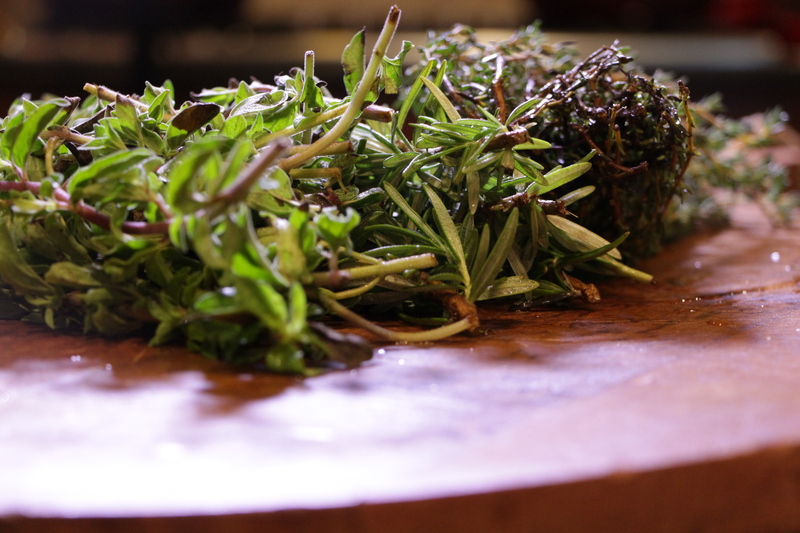 Our patients have requested sustainable substitutes in Thanksgiving day recipes. 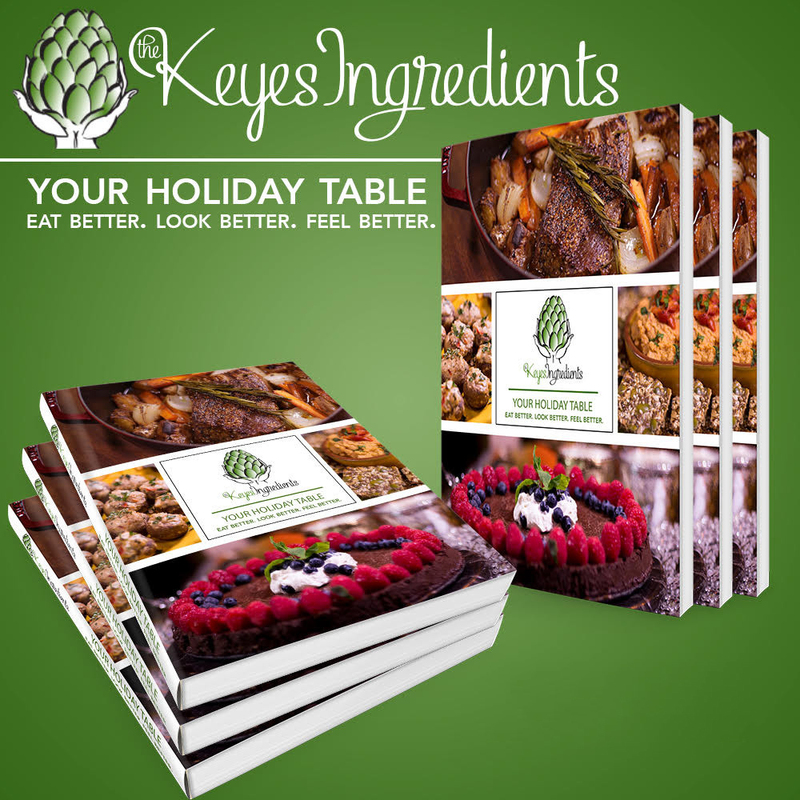 At The Keyes Ingredients we call those “Four-Mula’s” and have created a very special book called Your Holiday Table. The recipes in this book are free from refined and/or processed foods. 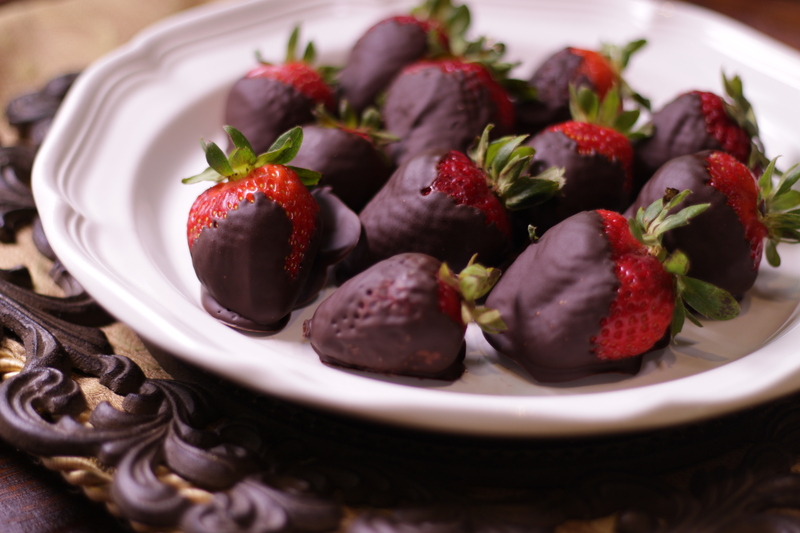 They were developed using whole, nutrient dense foods and sweetened naturally. 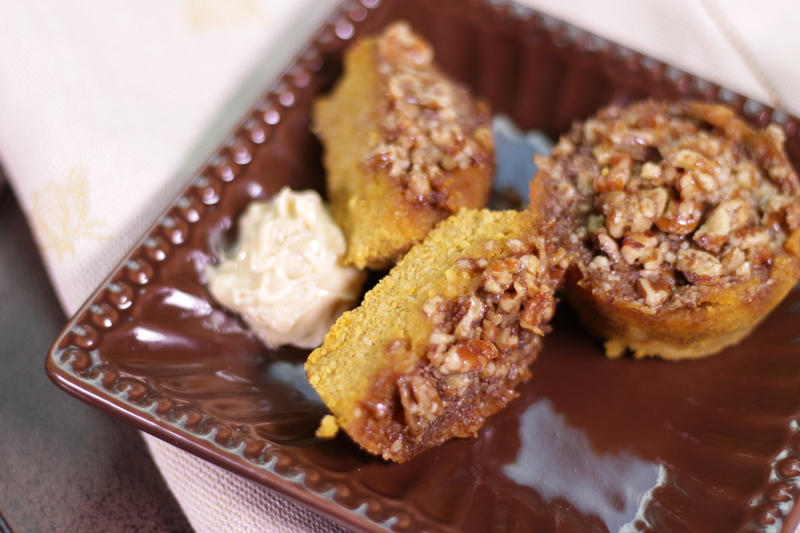 Every recipe is packed with flavor and the “Four-Mula’s” are paired together beautifully. We have done all the planning for you. We have included finger foods, dips and many more tasty appetizers, starters that will surely make your family’s tradition list, festive salad choices and main courses that take center stage along with your choice of dressings, gravy and cranberry sauce. Our side dishes range from sweet to savory and everything in-between. It is Thanksgiving after all, so we hope you will indulge in our decadent dessert choices. 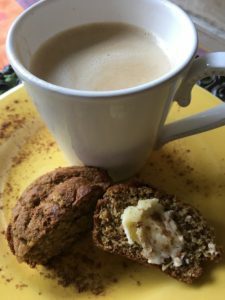 From “Olive us” at the Keyes Ingredients, be safe, choose wisely and have a wonderful Thanksgiving and enjoy this gluten free (but not grainless) pumpkin pie muffin recipe in the mean time. Stir, simmer 5 minutes and set aside. In a blender combine banana, eggs, greek yogurt, shredded coconut, oats (rolled or ground steel cut), baking powder, baking soda, salt and hemp seeds. Add pumpkin/nut mixture and stir. Pour 1/3 of a cup into each muffin paper/tin.